Weighty Matters: World's Most Dangerous Piece of Cake has 5x the Calories & Sugar of BK's Bacon Sundae! World's Most Dangerous Piece of Cake has 5x the Calories & Sugar of BK's Bacon Sundae! 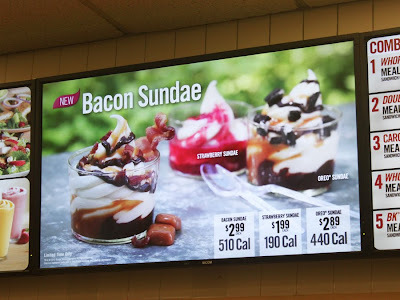 Amazing the hoopla over Burger King's bacon sundae when really it's quite a bore. Sure it's got 510 calories and 15 teaspoons of sugar, and yes of course it has bacon, but compared with what else is out there nutritional travesty wise this one's a sleeper. McDonald's Large Rolo McFlurry - 830 calories, 26 teaspoons of sugar. The Keg Carrot Cake a la mode - 2,344 calories, 65 teaspoons of sugar (just 7 teaspoons shy of 1.5 CUPS)!